BTV televises live events and important video programing for Boise State. On the 24/7 programmed channel, Cable One channel 60, you can view distinguished lectures, music department performances, club sports, and more. You can also tune into the youtube simul-cast by simply clicking here. University Television Productions produces live multi-camera broadcast and streaming for events on Boise State’s campus. Many of these events can be viewed live here on the BTV page or viewed on demand. Newsline, Presents, past Clubs Sports, Table for Three, various special lectures, and other programs are all available as videos on demand. Community Media is a television studio production course that produces the show Boise State in the Community. This program features many of Boise State Service Learning courses. 360° Videos of Boise State events, Live and On-Demand. 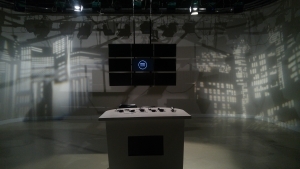 TV studio ready for the next show. If you are interested in live streamed Club Sports you can tune in here! University Television provides administration for BTV, UTP, Community Media, and media production equipment and facilities in the Department of Communication and Media.